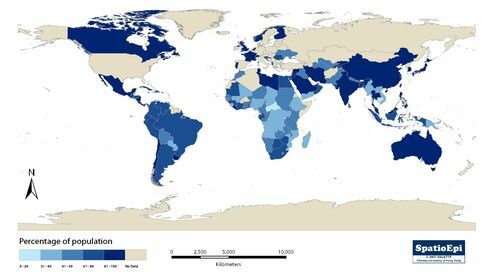 Access to safe water is measured by the number of people who have a reasonable means of getting an adequate amount of water that is safe for drinking, washing, and essential household activities, expressed as a percentage of the total population. The map shows the distribution of access to safe water in 1990- 1996. It reflects the health of a country’s people and the country’s capacity to collect, clean, and distribute water to consumers. The human body consists of anywhere from 55% to 78% water depending on body size. It is suggested to drink about 2 litres of water a day. Lack of water can lead to dehydration, confusion and is eventually, fatal. Safe water is important in our day-to-day living. However, there are countries that still have difficulties in accessing safe water. Common impurities include bacteria (e.g. vibrio) and even harmful metal salts.